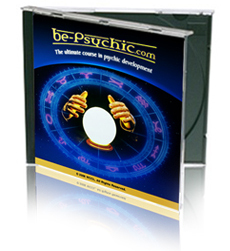 ﻿ Be-Psychic.com The Ultimate Psychic Training Course! For A Full $25.00 OFF The Usual Price! And I'll Show YOU What I Believe About Psychic Powers." Plus, I'll offer you the chance to find out about developing your own psychic powers. We can not guarantee that this product will work for you. But if you're not completely happy with the results, just let us know within 90 days and we'll refund your order. No strings attached. Hopefully, when you read this letter you'll see that YOU can be able to tap into your psychic talents too! My name is Bradley Thompson. I'm the author of several best-selling self-development books, including "Developing your own Subliminal-Studio" and "Lucid Dreaming in Seven Days". I'm the man behind the Subliminal Power software tool, currently used by over one million individuals and praised by world leaders and Olympic athletes. I developed the 4-part Encoding System™ used in Subliminal-Audio CDs. I commissioned the Binaural Beats CD range through our studios in Australia. I'm one of the co-founders of Instant-Hypnosis.com and I even developed the popular Lucid Dreaming Kit you can find for sale online. Commercial clients through Self Development Network include the US Army, IBM, the BBC, British Telecom, Fujitsu, Merrill Lynch, Dow Jones, Time Warner, Intel and even Microsoft. I have a great reputation in the world of self-development. And that's why I'd like you to take five minutes to let go of your doubts and open yourself to just the SLIGHTEST POSSIBILITY that what I'm going to tell you JUST MIGHT have an amazing effect on your life! Including WHY Most People SUPPRESS Their SIXTH SENSE! And I also know that I probably won't have your valuable attention for long, so let me be brief. Firstly, this course is TOTALLY and UTTERLY SAFE. Forget all of the spooky movies and mind control rubbish you see on television. Psychic powers' are just another sense, the same as touch, taste and feel. Ever seen a flock of birds flying - and suddenly they all change direction? How do they communicate? They use no sound, and no low- or high-pitched noises. They don't "follow the leader" or use any other known form of communication. Scientists the world over admit that birds have ANOTHER sense that we don't yet know about... a "sixth sense". Most people just DON'T KNOW HOW that sense works, or just don't belive that it exists. Secondly, ALMOST ANYBODY can develop this sense. I, and many others like me believe that, just like any sense, the psychic one is something you can develop. Have you ever seen someone healing from one or two broken legs? After spending so much time without using their legs, the brain "forgets" how the leg muscle works. It requires training for the brain to get back in touch – and within a few weeks, they're off running again! But occasionally that hidden muscle twitches... you get a "hunch"... or you think of someone and moments later they call, or you bump into them... or perhaps you suddenly think of a song for no reason and then switch on the radio and it's playing (that happened to me this morning!). And when that muscle twitches, I believe that it’s more than coincidence. So, let me ask – are YOU suppressing this other sense? "Please pass this to Bradley and publish on your site. I've read a lot of books and courses on psychic development. This is undoubtedly the #1 BEST!" Here's What I Believe About Psychic Powers & How They Work! PLUS - Discover What My Students in London Learned. -- And How YOU Could Learn It Too! I've been involved in the world of self-development for a long time. And as anyone in my position will tell you, there is one ultimate truth that persists throughout the whole of self-development, spirituality and even through science (thanks to a number of recent, exciting quantum physics breakthroughs). And that truth is... We're all connectedin some way.. If you've EVER read or watched the Celestine Prophecy, the Attractor Factor, the Self-Aware Universe, the Holographic Universe, the Red Circle, The Secret, What the Bleep, It Works!, the Cosmic Ordering System, or the Power of Intention, you'll know what I mean. We're all ultimately connected at a deeper level. We're all part of an all-knowing universe. A sort of massive database of knowledge that we can tap into when needed. Think about is as nothing more than the ABILITY to tap into that database! Three years ago, I held my first seminar in Scotland, where I taught my students what I knew about this so-called ‘psychic power’. After my original seminars, I was prompted to put what I knew into some form of online course. I was initially hesitant - but knew such a project had potential. So I began. And for two years, I've been refining my techniques and developing what I believe to be the ULTIMATE course in psychic development. It's name? Quite simply – "Be Psychic!" And NOW, for the first time ever... I want to share it ALL. With YOU! "You were an amazing teacher, Bradley. But the new course is even better. I've made amazing advances since we met in London. You won't believe how much embracing my natural psychic power has enriched my life!!" So, What Do You Get With The Be-Psychic Course? If you've ever read a book on psychic development, you'll know one thing. Most of the guides I read during my research contain a lot of "FLUFF". Well, let's get one thing VERY clear. I do NOT believe in wasting your time. I'll share information that enabled me to develop my sixth sense. Be Psychic! consists of THREE SEPARATE VOLUMES - each crammed with over 90 pages of secrets. You'll receive an honest low-down on POWERwhat we call 'psychic power'. From intuition to mind reading, from Astral Travel to healing, from spirits to crystal balls, from auras to numerology. Is it SAFE? Does it REALLY WORK? Will it BENEFIT me? HOW can I use it? I give you the HONEST answers based on many years of research into the subject. In Book One of my course, I innertell you about many of the techniques used by the world’s leading psychics. For example, the "Psychic Hotline", mind reading. "P-mail" I also show you some ways techniques that many people believe conclusively prove that Psychic Power really exists. Remember, once you know how they’re done, you can make YOUR OWN decision about whether they're 'real' or not. And remember, it's up to you whether you tell others about your hidden talents! "I never realized why I wasn't getting results until I discovered the (secret) part of the Psychic Hotline technique. It's so simple but I've not found it in one single psychic development book so far. Without it, you don't have a chance of developing. So why doesn't every book tell you about this?" And How to Benefit From That Research. Did you know that the US Government and the Standard Research Institute have independently proven that "remote viewing" is a genuine psychic talent? The CIA pumped millions of dollars into research during Project Scanate, Project Grill Flame, Operation Sun Streak and Operation Stargate. When these files were recently declassified, they showed the proven success of remote viewers – and how their findings of Russian military targets were verified by satellite imagery years later. It's immediately verifiable - just do a Google search. And thanks to research conducted by both the USA and Russian governments, you can benefit from their knowledgewithin the pages of The Be-Psychic Course. "I enjoyed my fifth Astral Travel session today - and it's only three weeks since I bought the course. Amazing. I journey to different worlds, chat to whoever I want. And thirty minutes seems like a lifetime... and I love every single second of it!!" "Please publish this on your front page. If you're thinking about having a go at the course, please do. It will improve every part of your life - relationships, wealth, health. Feel free to e-mail me with queries or any questions. Thank you, Bradley. You've given me back my wholesome life!" Course is electronic and delivered via download. "Just wanted to say thank you for the great service. I received the course in just 24 hours. And to provide a little feedback: I'm thrilled, because I just applied the first technique and won £25,000 this morning on a Camelot scratchcard! No April 1st here. Where can I buy an 'I LOVE BRADLEY THOMPSON' badge?" And Get These FIVE FREE BONUSES! Why? Because I'm going to tell you all about the five FANTASTIC bonuses I'm going to send your way if you decide to try out my new "Be Psychic!" course today. TWO FREE Hypnosis Sessions – RRP $25.90. FREE Advanced Memory Course – $29.95. FREE "How To Get The Truth Out Of Anyone!" – RRP $49.95. FREE 404 Self Improvement Tips – RRP $14.95. FREE Subliminal Power Suggestions File – RRP $9.95. And remember, these bonuses are yours to keep FOREVER – even if you decide to return the course! "I want to be honest, I planned to return the course. But I learned so much. I love the 'P-Mail' idea, really great. I've also healed my poor dog's leg much quicker than expected, and even used Astral Travel/Projection to speak with my adult heroine..."
When You Decide to Trial this Course! To Get Started, Just Click the Button, BELOW! AMAZING Books One, Two & Three of "BE PSYCHIC!" – RRP $285. The entire course series. Each book is around 90 pages in length, and is distributed in electronic format. FREE 14 BONUS AUDIO TRACKS – RRP $89.95. THREE audio exercises to complement each of the "Be Psychic!" books. FREE SOFTWARE TOOLS – RRP $149.95. Enjoy FULL versions of the Color Wheel, the Intuition Machine, the Meditation Station and the Visualization Station. FREE Bonus Gifts – RRP $130.70. Enjoy two free hypnosis sessions from Instant-Hypnosis.com; the Advanced Memory Course; "How to Get the Truth Out of Anyone! "; 404 Self Improvement Tips; and, the Subliminal Power suggestions file designed exclusively for the "Be Psychic!" course. FREE Lifetime Support – RRP $299.95. If you ever need support, we'll always be here for you. That's our total customer promise. Whether you have questions on the course or need guidance on your psychic development, our team is here around the clock to help you out. Guaranteed! That's OVER $1000 of material and FREE bonus gifts. And we'll send it all to you for the staggeringly LOW price of just... $99.95. As part of a special marketing experiment, we're currently reducing the entire "Be Psychic!" course and all its bonuses down to just $99.95 – if you purchase BEFORE midnight, Friday. Course is electronic and delivered via digital download. "I'm 56 years old and can only say that I wish I'd discovered these natural talents sooner. It's like I now have a secret gift nobody else knows about. My life has improved amazingly since starting. It's great to experience such a totally natural talent!" I believe we all possess a secret hidden talent inside ourselves. Some call it "psychic ability", others call it a "sixth sense", still others call it "touching the hologram". I believe it's how birds communicate. It's simply realizing that everything is energy – think of it as starting to learn how to flex a muscle we've ignored for way too long. So NOW is the time to begin – and I am confident that you can learn from the techniques I've developed. Get your copy and prepare for an exciting journey. You'll thank the minute you clicked onto this page forever. That's my personal promise to you!